Looks like you might be missing some roles in your role collection - the error messages seems to come from creating the mapping, not from ingestion. 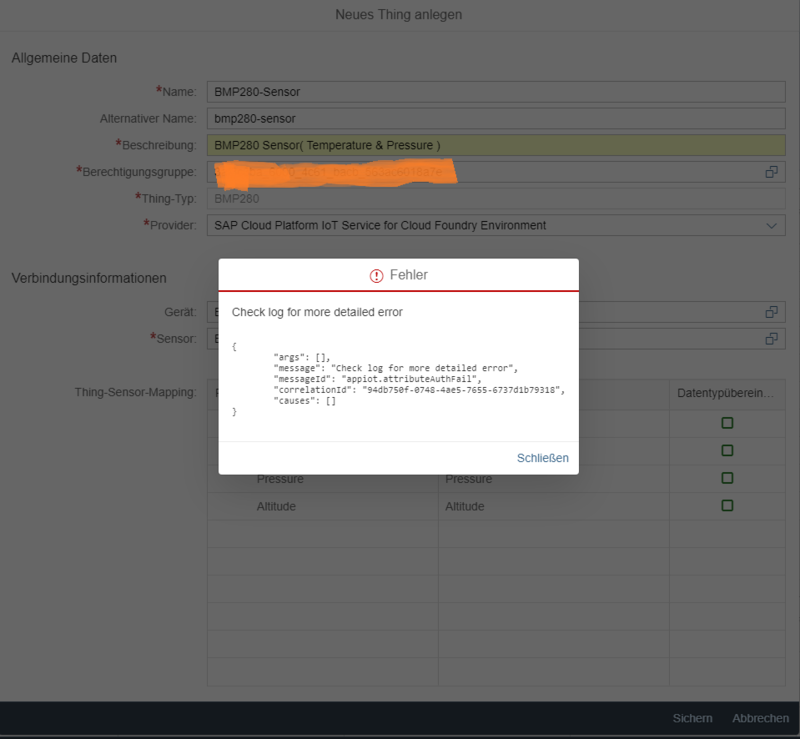 Ingestion error log shows content only if you connection between iot service and iot ae has been setup via a ticket - see the getting started documentation for iot service. We are also facing the same issue. you are correct , it seems like a authorization issue. but by following the help guides, we have assigned all the roles. do we have any specific roles to be assigned to overcome the issue. for one you might be better of using the new meta-model when you create a new thing type. Then you would go for the Thing_Engineer_Odata role when using the new Odata meta-model. Only with the Odata thing modeler and apis yo can make use of the flexible mapping and also all upcoming new improvements. Since end of January all features work around odata thing modeles end-to-end - also the web ide. Secondly in both cases other then the functional scope you also have to assign your role collection to the capabilities for thing, business partner and person. So you might be ok from a functional scope to creat a thing but additionally you have to setup the instance-based authorization such that you are allowed to create or delete things. attaching pictures of capabilities authorizationauth1.pngauth2.png.